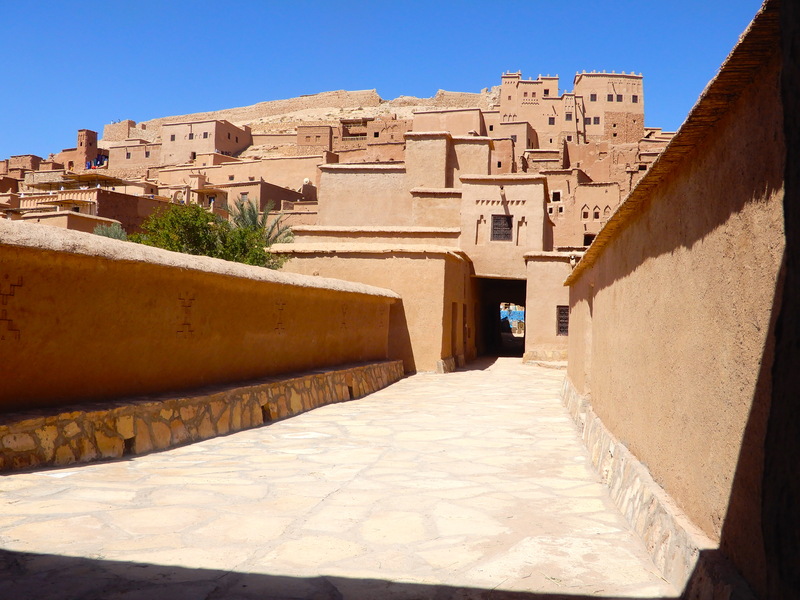 On our way to the Sahara desert we stopped off at Morocco’s well known High Atlas Mountain Hollywood territory, the Red Citadel of Morocco, Citadel of Ait Benhaddou in the town of Ouarzazate. The Hills Have Eyes was also filmed in the Moroccan Atlas Mountains – a true story apparently!!! Citadel of Ait Benhaddou is now a UNESCO World Heritage site. Although most of the clay buildings and the maze-like streets you see today are from the 17th century, a small number of families still live in this fortified village – it isn’t just a tourist attraction and film set! The bridge we crossed as we entered…. I think just about everywhere in North Africa can point to a few film locations. In Tunisia, we visited the locations of ‘Star Wars’, ‘The Life of Brian’ and ‘The English Patient’. But, the only movie connection we saw in Morocco was ‘Rick’s Bar’ in Casablanca …. where the movie WASN’T made! !